Federal court • Prosecutors failed to follow rules, violated constitutional rights, ruling says. Francisco Kjolseth | Tribune file photo Rick Koerber faces 18 criminal charges for his operation of FranklinSquires Cos. and related entities. The Utah County businessman hotly denies his businesses functioned as a Ponzi scheme, although the indictment alleges he used about half of the $100 million in funds the companies received to pay investors and make the operation appear profitable until it collapsed in 2008. 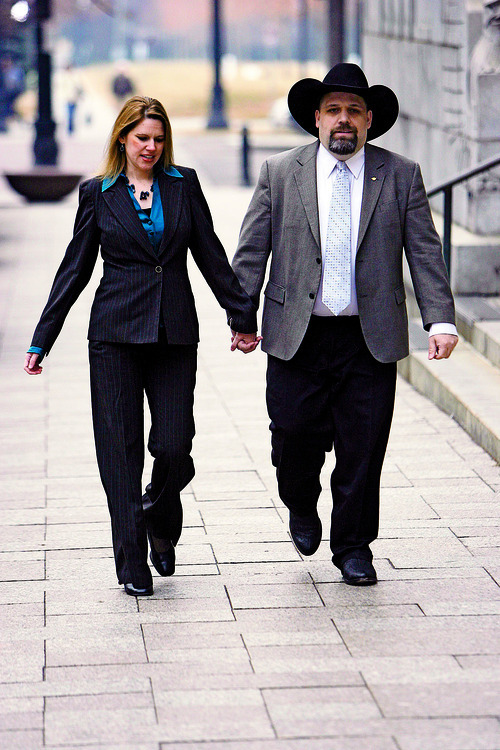 Tribune file photo Rick Koerber, arriving at federal court in Salt Lake City in 2010 with wife Jewel, through his attorney wants a judge to disqualify prosecutors and investigative agents in his case. 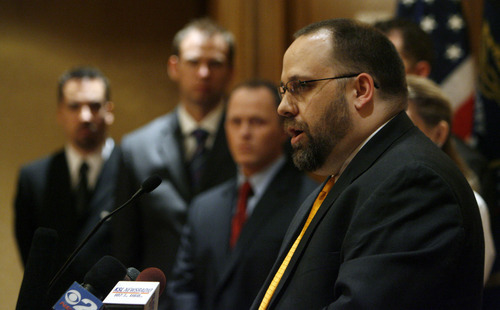 Francisco Kjolseth | Tribune file photo An indictment alleges that Rick Koerber used about half of the $100 million taken in from investors to pay back other investors and make it appear the operation was profitable when it was not. He denies the charges. A federal judge has prohibited prosecutors from using as evidence interviews former Utah County businessman Rick Koerber gave to investigators before his indictment for allegedly operating his real estate investment company as a $100-million Ponzi scheme. U.S. District Judge Clark Waddoups ruled that prosecutors and investigators violated professional conduct rules, federal law and Koerber&apos;s constitutional rights when they failed to contact attorneys who had represented Koerber prior to two interviews in 2009 with FBI and IRS agents. Waddoups chided prosecutors for not attempting to contact the lawyers, who had represented Koerber, the chief owner of FranklinSquires Cos., after Koerber had contacted an agent and expressed a willingness to talk. Even though defense attorney Max Wheeler had told prosecutors at some point that he was no longer retained by Koerber, Wheeler also had suggested they call other attorneys who had represented Koerber or his companies in the past, Waddoups wrote. But prosecutors did not do that because they likely would have been told there would be no interviews, the judge wrote in the ruling, adding "the way it was approached at least allows an inference that they didn&apos;t want to get that response, they wanted to be coy and say, can we justify saying that he&apos;s not represented so we can interview him." Koerber&apos;s attorney, Marcus Mumford, characterized the decision as tossing out a key piece of evidence against his client. "This is a significant blow to the government&apos;s case," Mumford said. A spokeswoman for the U.S. Attorney&apos;s Office for Utah said she could not yet say whether the government would appeal. "Because there are issues pending in this case, we feel it would be inappropriate to comment on Judge Waddoups&apos; ruling at this time," Melodie Rydalch said in an email. The government has not revealed the extent of its evidence but it has dozens of boxes of records from the company and agents have been investigating since 2006. The ruling is the second time Waddoups has thrown out a piece of government evidence. He ruled in 2011 that a draft of a letter to key investors in FranklinSquires could not be used against Koerber because it was part of consultation with his attorneys and there was no evidence it had been actually mailed. Last year, the judge also dismissed two charges against Koerber, ruling the indictment was too vague in spelling out the allegations. Koerber still faces 18 charges of fraud, money laundering and tax evasion. Koerber was originally indicted in May 2009, with 19 additional charges added in a second indictment that November. A third indictment was sought by prosecutors after Waddoups ruled the letter could not be used as evidence. Koerber denies he operated his FranklinSquires Cos. and related entities as a Ponzi scheme, although the indictment alleges he used about half of the $100 million in funds the companies received from investors to pay earlier investors and make the operation appear profitable until it collapsed in the real estate bust of 2008. Koerber promoted his "Equity Milling" form of real estate investments on billboards and magazines, and through seminars that people paid several thousands of dollars to attend. He later took out billboards and went on his radio show to tweak state regulators who began probing his operations before its collapse.